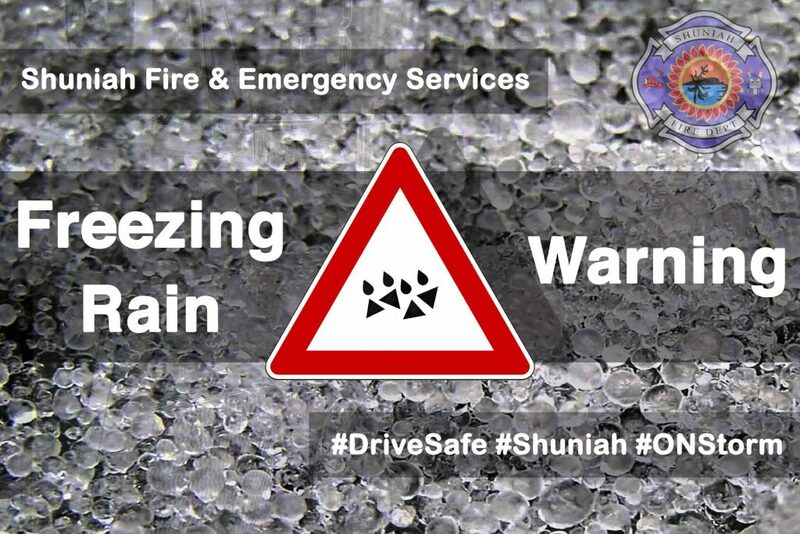 SHUNIAH, ON – April 25, 2017: Shuniah Fire & Emergency Services is advising residents to be prepared for a long period of freezing rain tonight and tomorrow. Environment Canada is expecting ice accumulations due to a long period of freezing rain starting near midnight tonight and continuing into tomorrow. Surfaces such as highways, roads, walkways and parking lots will become icy, slippery and hazardous. Ice build-up may cause tree branches to break and power outages may occur. Reduce your speed in slippery conditions. Watch for taillights ahead and maintain a safe following distance. Debris on the roadway should be reported to the OPP at 1-888-310-1122. If you see downed wires with no immediate risk, call Hydro One at 1-800-434-1235. If wires are over a roadway or on fire, call 9-1-1. Shuniah Fire & Emergency Services advises people to have everything they need for up to 72 hours, including food, water, medication, batteries and other necessities.